The ads will appear in magazines like Boating Life and Pacific Coast Sport Fishing. According to the pressie, a Wellcraft boat buyer is a 2nd or 3rd-time boat owner, more concerned with utility than frills. But cracks like that "Windsor knot" joke have a funny way of attracting just the kind of people you hope to separate yourself from. We wouldn't be surprised if a few pinstripe-clad, "spiritual" boat owners came ambling up the marina at cocktail hour, eagerly pursuing an authentic man's-man Wellcraft. 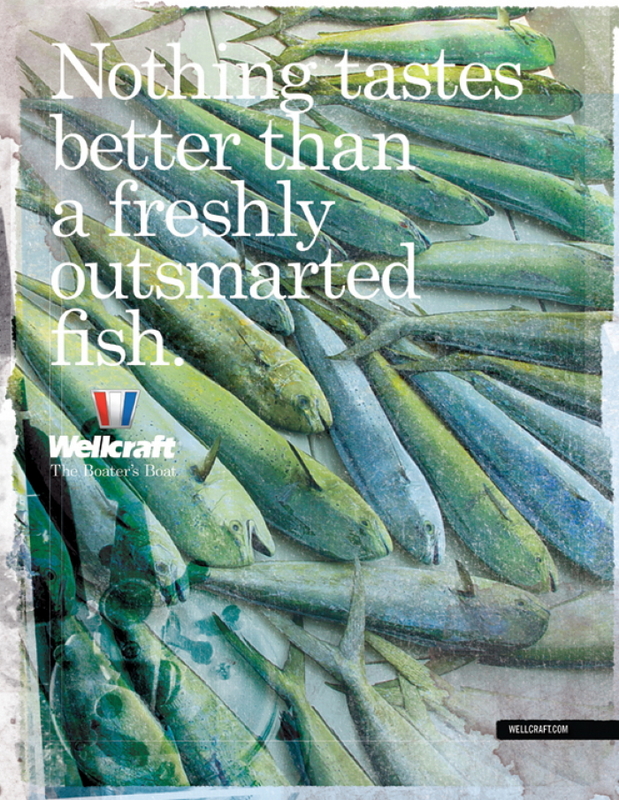 Nothing tastes better than a freshly outsmarted fish. 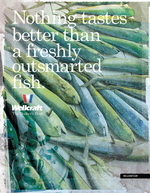 It is kind of interesting Wellcraft is going back to a 70s approach of catch and kill everything. And to market a boat as a tool to kill Mahi-mahi Dolphin Fish is sad. Plus the picture is a from a comercial boat that kills Mahi-mahi for restaurants, they are frozen and blue because they have been dead for days. The Dolphin Fish is bright turquiose, green and has wild yellow patterns, which fade almost immediately upon death. Sportsman like to catch and release the fish and only keep a few to eat.................Great Sportsman release fish, a program that has taken twenty years to catch on. And now a Wellcraft (Boaters�s Boat) wants you to buy there boat to empty the ocean. You�ve never been seasick. Bet you�ve been landsick a few times though. You wouldn�t be caught dead with a fruit in your beer. Unless, of course, you were dying of scurvy. This headline has been modified from a beer company. Please!! !